Will the UN get Molly's mother back to her? Is it just me but doesn't it worry you that the female hostage taken by the Iranians, Faye Turney, has a three year old daughter left behind in England. And needless to say this particular hostage has been singled out by the Iranians for display and pressured to apologize in front of the cameras. Its a great thing to serve your country but there are serious questions to be asked about the mother of a three year old child not being with her daughter but half the world away plying her trade in a war zone. You can count on the Iranians and the media to play this card to tug at the heart strings of us all. The role of women in combat zones needs a serious rethink. But political correctness will probably not allow this. Anyway the UN is on the case. They have just issued a statement expressing "grave concern". I bet that's got old Ahmadinejad quaking in his boots. Where is Maggie Thatcher when you need her? "I may be a list MP but I have to take note of what my community is saying,"
These words were uttered by Jackie Blue when explaining her change of stance on Sue Bradford's anti-smacking bill from For to Against, along with two other National MPs, Paul Huticheson and Simon Power. It shows that Jackie Blue grasps the fundamental reason for preferring democracy over other forms of Government, to wit, the wishes of the community are generally respected. It also highlights a fundamental flaw with MMP. Under this system list MPs are beholden more to the party apparchiks than the people. And when Jackie Blue says "
I may be a list MP but I have to take note of what my community is saying,"
she is tacitly admitting that list MPs may be insulated somewhat from following the wishes of the people. Whatever, the view of the community on Sue Bradfords bill is abundantly clear but it seems there are enough MPs in parliament who don't give a toss about that and will vote for it anyway. But Jackie Blue will not be amongst them. Is this the collapse of the US Democratic Party? The story has just broken in a regional magazine in the US (funded by The Nation, a left-wing publication), that Senator Diane Feinstein had a major conflict of interest and directed major federal defence contracts to companies owned by her husband. Sue Bradfords bill is no longer a private members bill initiated from a third party but has become a Labour Government bill as Lucyna has noted here. 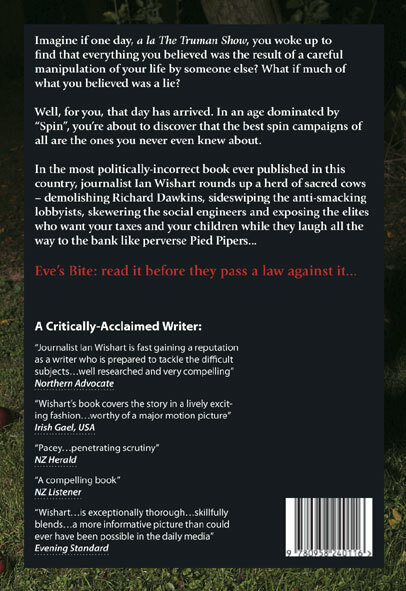 The ever watchful Whaleoil has identified that Helen Clark invoked the old fundmentalist right wing Christian bogyman to criticize those who oppose her agenda. Funny how I have never heard anyone use the term "fundamentalist left wing athiest" in political discourse, perhaps thats because the right tend to argue ideas on their merits rather than sling gratuitous "insults". Lindsay Mitchell attended the march at parliament and posts on her experiences here . And as commenter Barnsley Bill noted in this comment the bill is the price Labour is prepared to pay in order to keep the Greens on board, a necessity for Labour keep power in order to see other pernicious items on their agenda see the light of day. I'm sure on a personal level Mrs Peter Davis supports it. Unfortunately she has had absolutely no practical experience of dealing with a child who is determined to microwave the cat or who has a meltdown in the supermarket because the word "NO" has been used in response to a demand for a overpriced chocolate dinosaur strategically placed at a small child's eyelevel at the checkout counter. All in all an example of an arrogant Government stuck in its ivory tower and totally out of touch with lives and practical realities of the majority of the citizens it purports to represent. Looking into this further although Radio New Zealand and TVNZ are both reporting that the Labour Government have taken over ownership of the bill, the Labour Party have not yet formally acknowledged this. The government now holds all the cards on the anti-smacking bill. Bill sponsor Sue Bradford says she has agreed to a request from Deputy Prime Minister Dr Michael Cullen to have the legislation become a government bill. It means the bill could be debated under government auspices as early as Thursday. Bradford says it is now up to the government to determine the process by which the bill will be put onto the order paper. She says as far as she knows nothing formally has happened yet but it is her hope parliament gets to it as soon as possible. Labour is now hard at work talking with minor parties. Cullen is not saying any more than the fact the matter is under discussion, but it is understood talks are ongoing with the Maori Party and New Zealand First. Hmm, what sort of deals are being done I wonder? MMP at work friends, the tail wagging the dog. 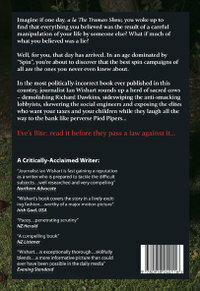 Could those blogsites wishing an advance review copy of Ian Wishart's outrageously politically-incorrect book, EVE'S BITE, please email us your postal details and your blogsite so we can send them out... Review copies are limited so first in, best dressed. I may be wrong, but I suspect we are the first publisher, possibly in the world, to offer review copies to blogs. A recognition, I think, of the growing role the internet is playing in society. It's not very often I agree with Keith Locke. But when he says it was "disgraceful" to prevent Ken Wang, a reporter with parliamentary press gallery accreditation, from covering a meeting between Michael Cullen and Chinese Vice-Premier Zeng Peiyan, I have to concur. He had been given permission to film the event but when he turned up he was informed that the permission had been rescinded and he must leave. Dr Cullen said there had been a misunderstanding and Wang was removed "after he got upset". "I think it's unfortunate that Wang got himself overly wound up on that matter." He said due to the large Chinese delegation and media, space in the eighth floor meeting room of the Beehive had been an issue. Alas for Dr Cullen this incident is on film. The disturbance that occured was Ken Wang was removed by a Diplomatic Protection Officer who told him his permission, from the speaker of the house, Margeret Wilson, had been rescinded. Rescinded it was, but by whom? Did a New Zealand police officer act at the behest of a chinese official? Or did Dr Cullen bow to the wishes of the Chinese delegation and give the word? Parliament's Speaker, Margaret Wilson, wants to ensure an incident in which a journalist was stopped by police from covering Chinese officials at the Beehive is not repeated. An easy solution would be for her to remove Nick Wang's press gallery accreditation. But that would the wrong solution and I doubt that New Zealand is about take that path, which is a small mercy. There are obviously not enough. Even though they managed to perform 186,400 abortions in 2005 there are clearly not enough doctors in Great Britain performing abortions to meet the demand. So now there is a proposal to allow nurses to do the dirty deed. From the 2004 budget and coming fully into force this year was the much vaunted 20 hours free childhood care and subsidies for parents who required more than this for their offspring. What difference will free early childhood education for three and four-year-olds in community services make? Parents won't have to pay anything for their 3 or 4 year old child to attend teacher-led services for up to 20 hours a week from July 2007. This will open the door to more children being able to participate by reducing the cost to parents, and that'll help parents make decisions about their role in the workforce. The lid should also be kept on costs to parents whose three and four-year-olds receive early childhood education for 20-30 hours a week thanks to the extra government funding to lift quality. Some educational experts are accusing the authors of trying to make their conclusions go away. The findings are certain to feed a long-running debate over day care, experts say. The debate reached a high pitch in the late 1980s, during the so-called day care wars, when social scientists questioned whether it was better for mothers to work or stay home. Day care workers and their clients, mostly working parents, argued that it was the quality of the care that mattered, not the setting. But the new report affirms similar results from several smaller studies in the past decade suggesting that setting does matter. “This study makes it clear that it is not just quality that matters,” said Jay Belsky, one of the study’s principal authors, who helped set off the debate in 1986 with a paper suggesting that nonparental child care could cause developmental problems. Dr. Belsky was then at Pennsylvania State University and has since moved to the University of London. Common sense suggests that for a young child a lot quality time with adults who have a stake in his or her long term interests will do better than one who is passed from adult to adult whose contact with the child is short term at best. "It takes a village to raise a child" sounds good in theory but a mother and father who love that child and demonstrate it with care and attention is really the optimum solution to producing well adjusted adults. I doubt we have heard the last word on this study. With a RNZ survey showing at least 75% of Kiwis opposed to Sue Bradfords anti-smacking bill, the attempt by Labour to push it through under urgency was utter stupidity. It seems like Michael Cullen has belatedly realized this. Perhaps the penny will drop even further and this unworkable piece of legislation will not make it into law. Labour could save face by allowing their MPs a conscience vote. In the supermarket yesterday, as is ususal for a Sunday, the Sunday papers were stacked in high piles at the checkouts. The Sunday News had a particularly lurid front page, illustrating the story which dominated the issue and dominates the New Zealand media this morning. The story itself adds little to what we know already about Brad Shipton, he is a total sleazebag, its basically uninteresting in any other regard. There is another story from Australia, it concerns an Australian scientist, Vanessa Woods who works for the Max Planck Institute for Evolutionary Anthropology. Ms Woods is promoting her new book "Its Every Monkey for itself"
Imagine you live in a remote village in Central America. Every morning the alarm wakes you up, and for the next 14 hours you run through the jungle, chasing monkeys. You don’t know why you do it. You just do. You see everything. They quarrel. They copulate. They stab each other in the back. Imagine you live in a house with eight other people. You quarrel. You copulate. You stab each other in the back. Slowly, the differences between you and the monkeys - the differences you assumed would always be there – disappear. Memories of civilisation fades. The jungle takes over. Mosquitoes swarm in clouds. Fungus creeps into your crotch. Killer bees conspire to murder you. Something pushes you over the edge. Maybe you smash your head on a rock. Maybe you fall in love with the wrong guy. Maybe it’s something worse. It’s every monkey for themselves is a young woman’s story of life in the jungle. Witty, troubled, and deeply moving, it is about the lovers that trip you up, and the friendships that keep you going. Above all, it is a triumphant account of survival, camaraderie, and love - monkey style.